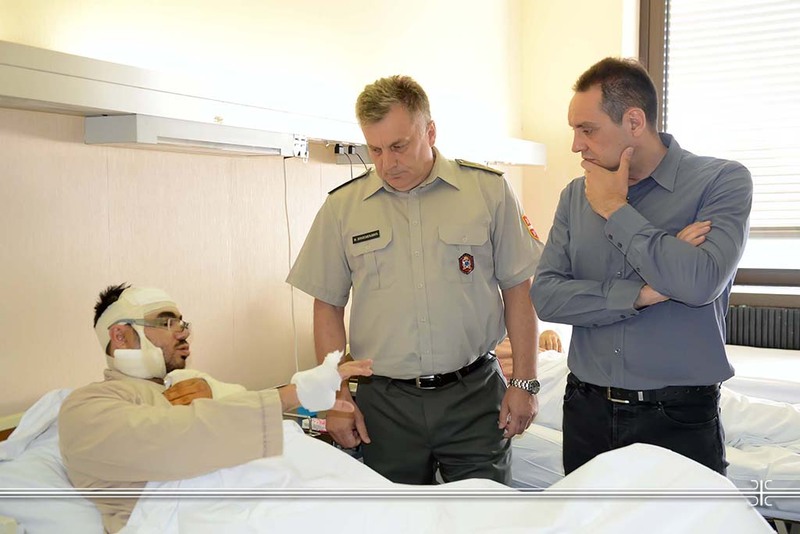 Defence Minister Aleksandar Vulin visited today with the Acting Head of the Military Medical Academy Colonel prof. Dr. Miroslav Vukosavljevic, two injured from the Center for Social Work of the municipality of Rakovica, who are hospitalized at the Military Medical Academy. Minister Vulin visited the patient Danijela Mihailov (1972), who after the injuries in the hand and back area was taken care of at the Clinic for Plastic Surgery and Burns of the MMA and the patient Vojkan Tomicevic (1979) who, after serious injuries in the head, neck and hand, has been recovering successfully at the MMA Clinic for Maxillofacial Surgery. During his visit, Minister Vulin, having talked to patients and medical staff on-call, said that the injured were provided with all necessary medical care and that they were in stable health condition. He told patients that "nobody would have resented if they were frightened, but they did not, because, when a human being, if we can talk about a human being, kills his wife and his four-year-old child, then we are talking about the incomprehensible extent of evil and about something that cannot be described by words". - The social workers who opposed this monster are heroes. These are people we do not talk about enough. These are people who have prevented a greater tragedy because that monster would surely continue to do what he started to do. These people did not think what they should do, but they did what we all would like to have the courage to do, if ever there is such an incident and if we ever witness such evil. We should thank these people, and when we criticize the system, that's fine, and we need to criticize the system. The system will be better, it will be improved, we will see where the mistakes are to correct them, but when criticizing it we should never criticize these people. They're heroes. Let's say thank you because they really deserve it, Minister Vulin said. - Defectologists and social workers have offered their lives to save the child and mother and to stop the monster. They're heroes. We do not repeat this often enough, we do not talk to them often enough. We should be proud of the quality of people working in the social protection system, and the system will be improved, changed, and will be better. As we have been working hard over the past years to make it better, I am sure that the authorities will make it even better. These people should be our pride, we should thank them because they really deserve it. The quality of people working in the social welfare system is for every pride, and everything else needs to be changed, needs to be improved, Minister Vulin said. According to Colonel Vukosavljevic, this is a type of complex trauma, primarily psychic trauma. - As a man who has an exceptional experience with the treatment of injuries to all parts of the body, it's a wonder that it just ended up on this. These people wanted to save a mother and child in their workplace. We do everything in our power. I hope that such injuries will be less in the future and that our children will move freely and that they will have their childhood as their mothers along with them, said the Acting Head of the MMA. Injured patients stressed that they "instinctively started to save the child and mother" and that the tragedy would certainly have been larger in size if the employees of the Center did not react in this way.